Here is an update from Matty Brennan – our Dig Deep Peak District competition winner. The next you will be seeing of Matty will be in the next trail running training film and we will be talking about his nutrition – hopefully with three very different athletes we should get a good cross section of knowledge and experience when it comes to nutrition. “The last few weeks havebeen a bit of a mixed bag – had a fantastic result from the Grizedale Trail 26, coming 2nd in 3:37, but then caught a dose of man-flu, which hasn’t been helpful to my training at all! The week ending with the Grizedale race was my biggest so far, covering 54 miles, with the last 2 weeks both at around 20, with approximately 2 or 3 runs per week, with my pace massively off. Feeling much better now however, with a big trail running weekend this weekend – running around Shropshire and the Long Mynd tomorrow (Saturday 15th March) with the Torq Performance Trail Team, and then another long one Sunday at the UTPD recce day. Thank you to everybody who joined us on the Dig Deep Recce day – it was a fantastic event, even if the weather wasn’t as kind as the week before. The event was led by Dave Taylor of Fell Running Guide and Ian Loombe our Race Director. Outside were fantastic hosts and we will be meeting there for the next one! In other news have you seen us in the latest edition of Trail Running Magazine? Make sure you pick up your copy quick to be in with a chance of winning a fantastic bag from our sponsors Mammut – and the chance to win freeentry to any of our Dig Deep Peak District races! 92 Days To go…#DigDeepPeakDistrict !! “I’ve just finished the 12th week of my 25 week training plan for the UTPD, which has been a 60 mile week. The whole plan looked really daunting when I stuck it on the wall at the end of last year, so it’s really satisfying to see I’ve now nearly reached the halfway point! I’ve been really enjoying my long runs over the past few weekends. I think this is in part due to improving weather (a little bit of sun does a lot for morale!) and also part due to the fact that I have been noticing improvement in my performance – I feel like I’m hurting less and recovering faster than before and it’s good to think that my hard work is taking effect! I ran my first long race of the year this weekend, the 32 mile Haworth Hobble, and I really enjoyed it. My first ultra was the Dig Deep Intro last July, which took me 7 hours to complete. The Hobble has similar elevation and is 2 miles longer, but I finished in 6 hours which I am super happy with. It was also nice to meet fellow UTPD first timer Drew, who recognised me from the training blog video, and chat about our training over post-race stew! As the ‘trail ultra marathon novice’ of the Dig Deep team I thought I’d share my experiences of my first ever trail ultra marathon in case any of you who have signed up to the Suffolk trail ultra marathon or the Peak District trail ultras as a first-timer and are feeling a little daunted! I signed up to my ultra after a large well deserved glass of wine whilst chock-a-block full of endorphins after a successful if much shorter trail race. 1 month passed with getting regular trail runs in. I was doing a steady 20 miles a week, which for me was very good. I’d finish work and head out to the fields with a more experienced ultra runner to get in some miles before the sun went down. I managed to do little and regular – every evening, even if training didn’t go well (which it didn’t a lot of the time! ), I celebrated the fact that even if I only did 2 miles, I was doing 2 miles more than I would be sitting on the couch! So for those of you who are training at the moment and it’s your first time – don’t despair if sometimes it doesn’t go your way, or your legs feel like lead, or your lungs feel like they are going to explode – keep it up, it gets better! By month 2 my training plan had to fit around a work schedule which was becoming more and more hectic. Although I tried to be structured I travel a lot for work, so it turned out to be ‘grab a run when I can’. My aim being to get out and do something, whatever the distance, every day. My point being everyone is different, some people can run to schedules but if you can’t then don’t panic! The best tip I was given when I was stressing about not being able to get out on big long runs, was to concentrate on spending long periods of time on my feet – even if it was just standing instead of sitting at my desk working. With only 1 month to go before the big day my ITB reared it’s ugly head – this was the first time I had encountered it, although it’s one of those mythical ailments that I’ve heard many runners whispering about. I spoke to Dave Taylor from Fell Running Guide and he gave me loads of advice, involving foams rollers (torture but amazing results) and ice buckets (similarly torturous but apparently amusing to watch). The day came, I ran, walked, swore, hobbled, almost crawled but after a few tears I finished and it felt AMAZING! The day after, despite not being able to walk, I felt invincible. The feeling of pushing your body to it’s limits and then pushing past those limits was addictive and a bit surprising. It’s interesting to find out what you can really do, especially when you think you can’t. If you’ve been mulling it over and I have convinced you to have a go then check out our latest trail race weekend in Suffolk 🙂 – we are celebrating all things awesome about trail running. There are 2 trail ultra marathons and 2 shorter trail races to choose from. It follows the same format as the Dig Deep Peak District and there will be camping, BBQs, running lectures, running shop, running films and of course 4 stunning races to choose from that take you across the most beautiful parts of the Suffolk countryside. 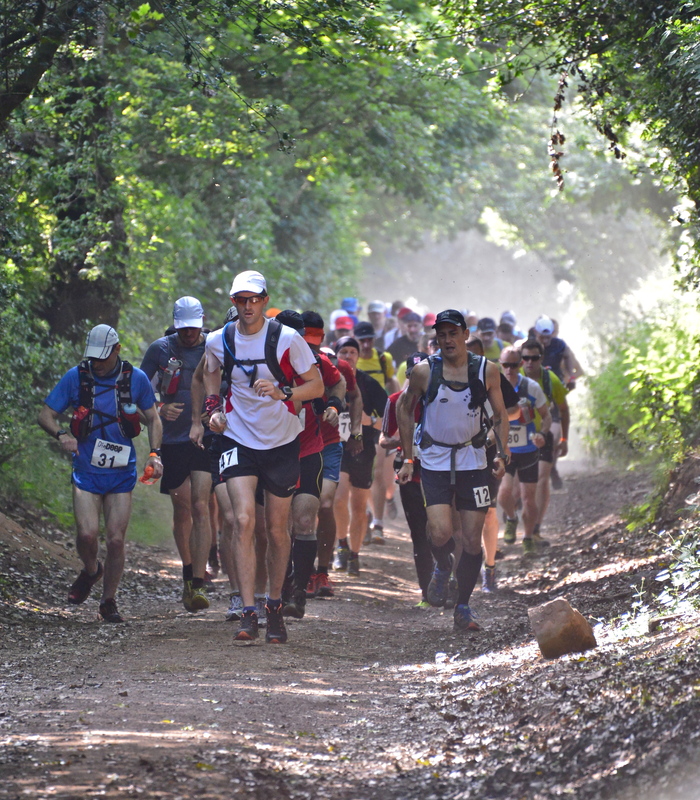 Ultra Tour of Suffolk – 50 mile trail ultra marathon in Suffolk – on trails through ancient woodland, pretty villages, open countryside and on coastal trails. Suffolk Trail Intro Ultra – 28 mile trail ultra marathon – perfect first timer ultra marathon, or if you are making the move from road running to trails. Rendlesham Dash 5.5 miles – gentle family jog or speedy trail demon! Come and join us and relax with local food, beer & plenty of tea! 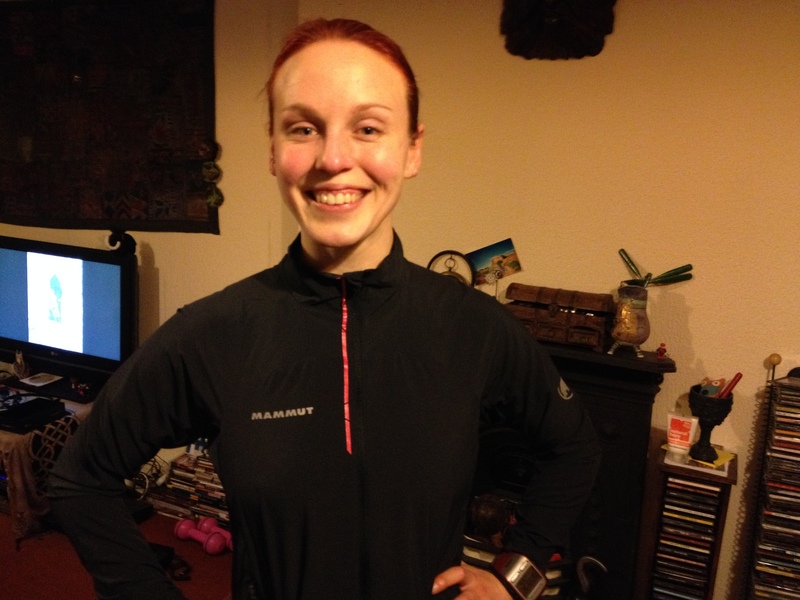 Sally has shared her latest training news for the Ultra Tour of the Peak District. Did you know there are less than 100 days to go now until the Dig Deep Peak District weekend?! In the last month each weekend has been taken up with lots of long runs. I have covered 20 then 26 miles on consecutive days of the West Highland Way, 21 miles of the Edale Skyline then completed the High Peak Marathon – a fantastic night ultra of 44 miles, in a team of 4 over the Derwent Watershed, thank goodness we won’t encounter the knee deep peat bogs in the UTPD! Last weekend I did the Grindleford Gallop 21mile trail race, considering the previous weekends mileage at the HPM I was delighted with 24th overall and 2nd female. Keen to avoid injury I have a low milage couple of weeks coming up before the Edale Skyline 21mile fell race in 2 weeks time. Favourite run: Hillsborough Hills – a 7 mile run from home which includes 11 hills of varying length, all in about 2 square miles! Not only is it Friday and the weekend is just round the corner but we also have some exciting news for you running lot! We have been working away on bringing to you Dig Deep Suffolk. The Dig Deep Peak District has proved to be such a popular and successful event that we have created another weekend of running down in Suffolk, where we already organise The Whole Hog. 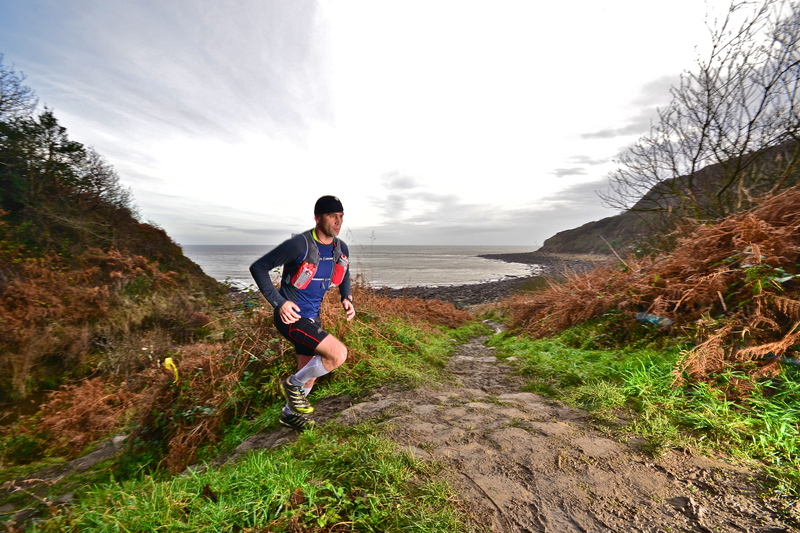 Once again you will be able to choose from two ultra marathon distance and two shorter trail races. We love to put together races that take in beautiful scenery and Dig Deep Suffolk is no exception – the routes cover forest trails and coastal trails, open countryside and pretty villages. There will be local beer, BBQs, live music, camping over the whole weekend – what more could you want?! We are pleased to announce that Sweatshop Ipswich are our retail partners. 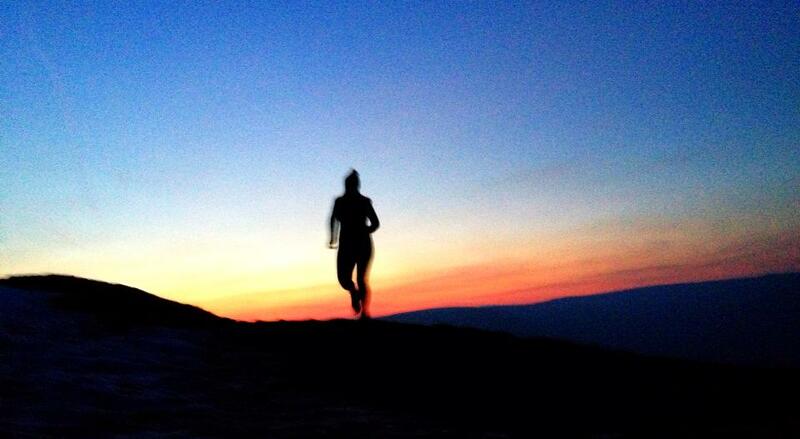 2014 really is the year to hit the trails! 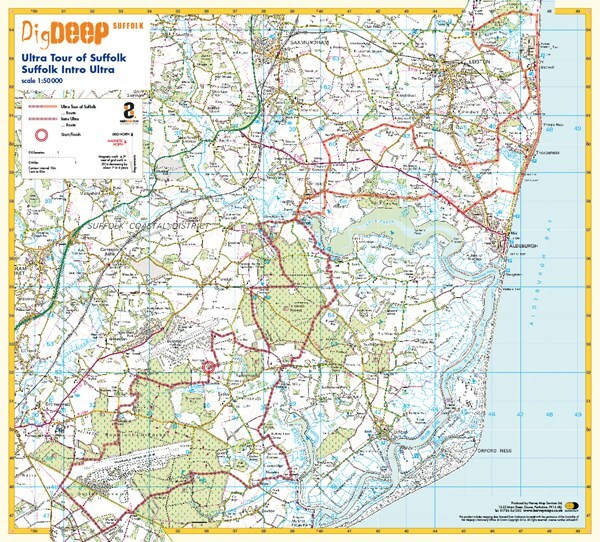 Eight Point Two are pleased to announce the launch of a new running festival, Dig Deep Suffolk; 6th and 7th September 2014 in Suffolk, England. Dig Deep Suffolk is believed to be the first event of its kind in the area and will feature trail running over a variety of distances and will comprise of the 5.5 mile Rendlesham Dash Trail Race, a 20k Trail Race a 28 mile ‘Intro Ultra’ Trail marathon and the 50mile Ultra Tour of Suffolk. The event will be based at Wantisden Hall (near Woodbridge) where competitor camping and registration will be located along with talks, demonstrations, films and running retail provided by Sweatshop (Ipswich). Wantisden is easily reached locally and is only 2 ½ hours from London! With the event planning for all the races in the hands of Eight Point Two, Adventure Event Organisers, the whole weekend promises to be one not to be missed. Dig Deep Suffolk is a new event following the success of Dig Deep Peak District. Eight Point Two are also the organisers of the ever popular Suffolk Whole Hog. Ian Loombe, Eight Point Two’s Managing Director said: “The Dig Deep Peak District event is really popular and we knew that Wantisden would be a fantastic spot to host another event. It’s taken a lot of work to get the routes finalised in order to make the best of the fantastic trails in Suffolk. However, the work has paid off and we think that the courses are superb!”. Ian Bliss, Co-race director, is from Ipswich and has spent many years running the local trails. “It’s a beautiful and diverse area” he said, “The coastline is stunning and the routes all go through the beautiful Rendlesham Forest. The trails show the best of Suffolk”. “The Ultra Tour of Suffolk, the blue ribbon race of the event, is a tough race but it’s probably accessible to all runners with the ambition of running 50 miles. If you’re looking to do your first ULTRA marathon then the Suffolk Trail Intro Ultra (at 28 miles) would be perfect! That’s the beauty of this route and event, it should appeal to everyone. The shorter races (Rendlesham 20km Trail race and Rendlesham Dash 5.5 mile race) are a great way for those taking their first steps into trail running to appreciate the difference from running on roads”. The Dig Deep Suffolk event will take place on the 6th and 7th of September 2014. Closing Date for entries is Friday 5th September 2014.